The Circle (Cycle) of Fifths (Fourths) is a delightful and elegant visual representation of relations between musical keys. The exact name for it depends partly on the area of the English-speaking world where one lives and partly on the instrument that one is learning when the image is first introduced. It seems that in parts of the world influenced primarily by US musicians it is generally called a Circle, and in parts of the world influenced most by musicians from the UK it is generally called a Cycle. Teachers of transposing instruments and teachers who lean more towards jazz styles than classical styles seem to prefer calling it the Circle/Cycle of Fourths, while teachers of keyboard and string instruments and those who teach classical theory seem to prefer calling it the Circle/Cycle of Fifths. All of these names are accurate and acceptable. Several other articles listed below describe details of the Circle. It is organized like an analog clock face, with twelve spots marking the twelve keys like the twelve hours of a half-day. 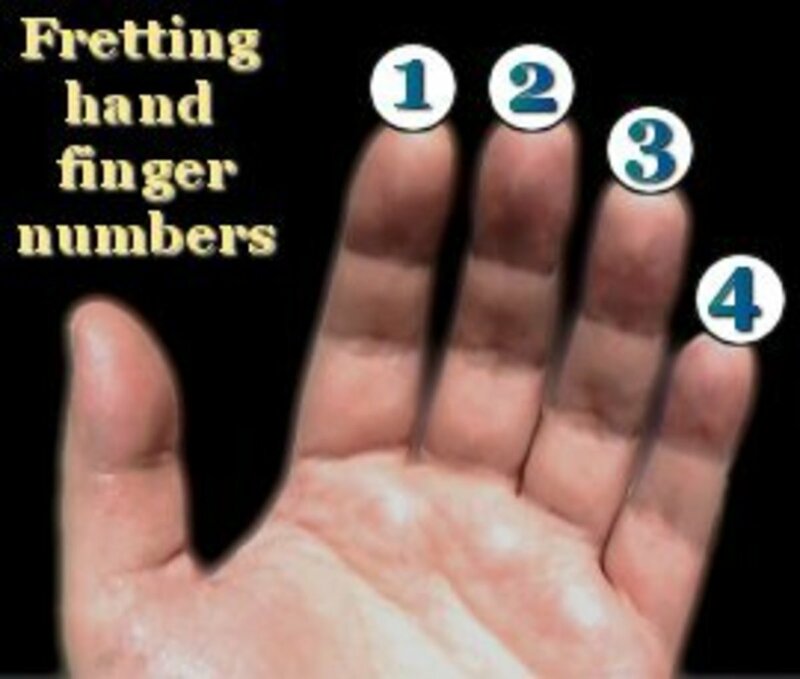 As one moves clockwise around the Circle, the musical keys are named in order such that each new key is a fifth above the previous one and also has one more sharp in its key signature than the previous one. As one moves counterclockwise (anticlockwise) around the Circle, each new key is a fourth above (i.e., a fifth below)the previous one and also has one more flat in its key signature than the previous one. Note also that the interval of a fifth above is the equivalent of a fourth below. We can just as easily and accurately say that when one moves clockwise around the circle, the next key is a fourth below the previous one, and when one moves counterclockwise around the circle, the next key is a fourth above the previous one. Sharps or flats are added around the circle until a total of seven is reached; that number gives each distinct note in the music alphabet its own sharp or flat. At the bottom of the circle are three pairs of “enharmonic” keys, that is, keys made up of pitches that can be represented in two distinct ways. The newest sharp (farthest right) in any key signature is a half-step below the tonic of the major key or a whole step above the tonic of the relative minor key. So, if you see a key signature with sharps (in this order) of F#, C#, G#, D#, A#, and E#, you will know that the major key for that key signature is F# (a half-step above the E#); the relative minor key is D#m (a whole step below the E#). The newest flat (farthest right) in any key signature is a perfect fourth above the tonic of the major key or a major third below the relative minor key. For example, Bb, Eb, and Ab give the key signature for Eb major (a P4 below Ab) and also for Cm (a M3 above the Ab). Stated another way – the way I actually prefer – the flat prior to the newest flat in any key signature gives the exact name of its major key, and that same next-to-last flat is also a minor third above the relative minor key. Using the same example as above, in the key signature Bb, Eb, and Ab, the next-to-last flat is Eb, and that is the name of the major key, Eb major; the Eb is a minor third above C, and the relative minor key is Cm. 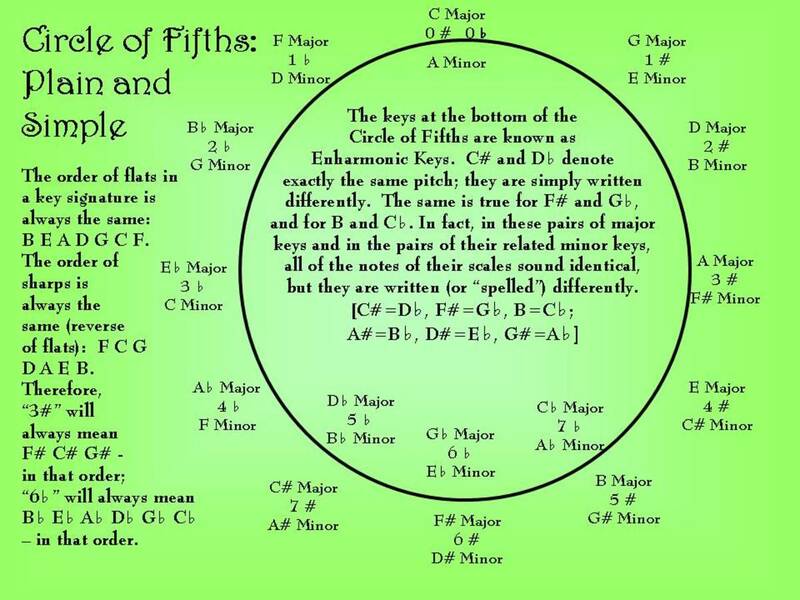 As you see on the Circle of Fifths, this last method does not account for the keys of F major and D minor; those are simply memorized. One very exciting addition to the uses of the Circle of Fifths is to notice on it the clustering of primary (I, IV, V) and secondary (ii, iii, vi) chords. Notice this cluster in the picture below. For any I chord, the IV and V chords are on either side of it on the Circle of Fifths; the ii. iii. and vi chords (Secondary chords) are on either side of and below it. These six chords account for chords built on six of the seven pitches of a given scale, but what about the chord built on the seventh tone? On the charts, that is referred to as the “missing” letter, and on it is built the least stable of the chords, the diminished chord (viiº in a major key or iiº in a natural minor key). For minor keys, the chords are still clustered (i, iv, v, and III, VI, and VII), but a note of explanation is needed. There are three types of minor traditionally used in Western music. One is known as the natural or pure minor (this is the Aeolian mode). In this form of the minor key, all of the pitches are identical to the pitches of the relative major key. So, in the key with two sharps (F# and C#), the major key is D and it includes the pitches D E F# G A B and C#. The natural or pure minor form of the relative minor key (B minor) employs exactly the same pitches, but beginning on B: B C# D E F# G and A. A more common minor in classical music raises the seventh pitch, the “leading tone,” to give the half-step introduction back to the tonic that seems so familiar and comfortable to Western ears. That form of the minor is called the harmonic minor. 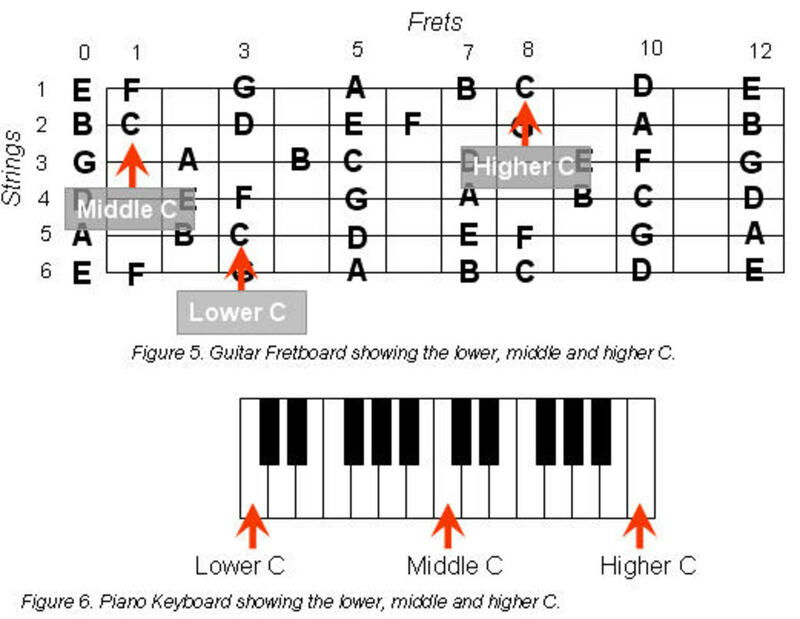 In the above example, the notes would be B C# D E F# G and A#. (A# back to B is a half step.) The third form of the minor is called melodic minor, and the notes used in it depend on the direction of movement of the melodic pattern. Ascending, both the sixth and seventh pitches are raised; descending, the pitches are identical to the pure/natural form of the minor. So B melodic minor, moving up one octave and then back down, would be: B C# D E F# G# A# B A G F# E D C# B. At any rate, when the pitches of the pure/natural minor are altered for harmonic or melodic minor, the structure of the chords of course will change also. 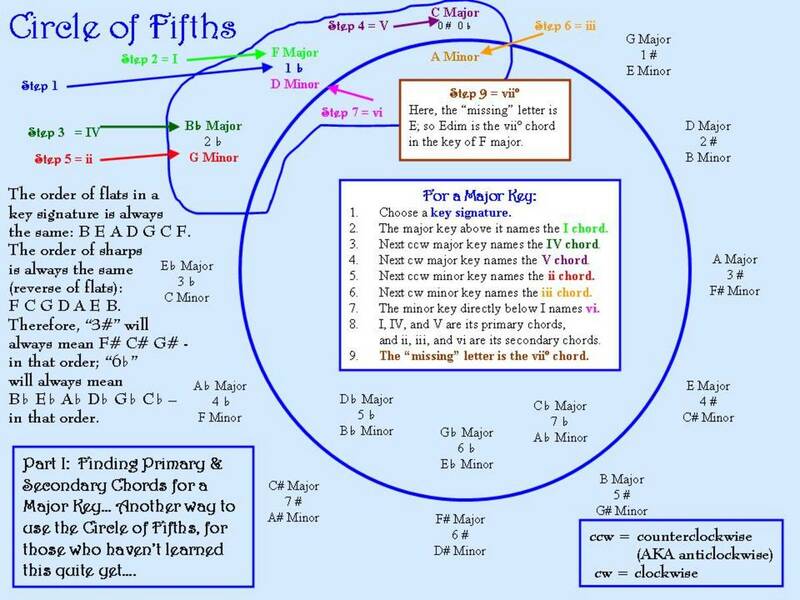 The cluster of related chords on the Circle of Fifths applies to the chords of the pure/natural minor. In the other forms of minor, the chords that change still keep the same root for the most part. 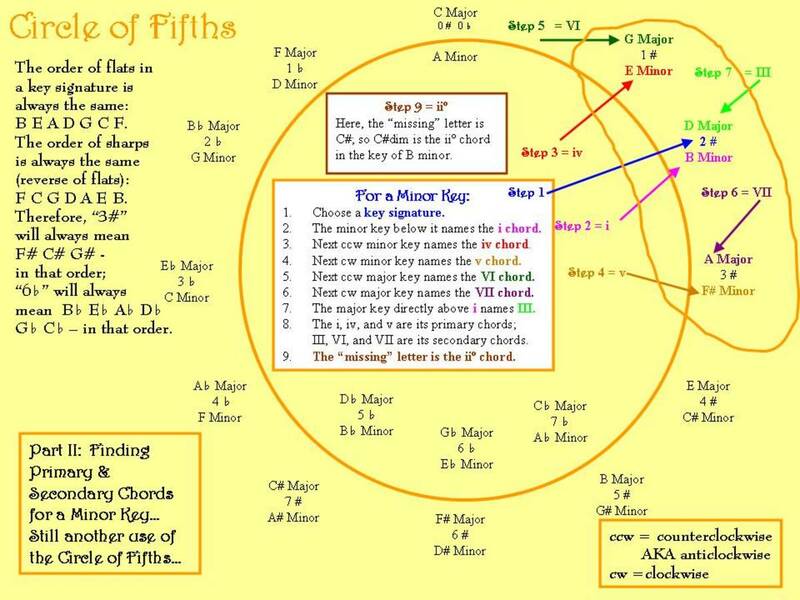 The point of this is to make you aware that the Circle of Fifths can help you to identify the Primary and Secondary chords for any given major or minor key, but you need to know which form of minor you are playing in order to use it effectively. 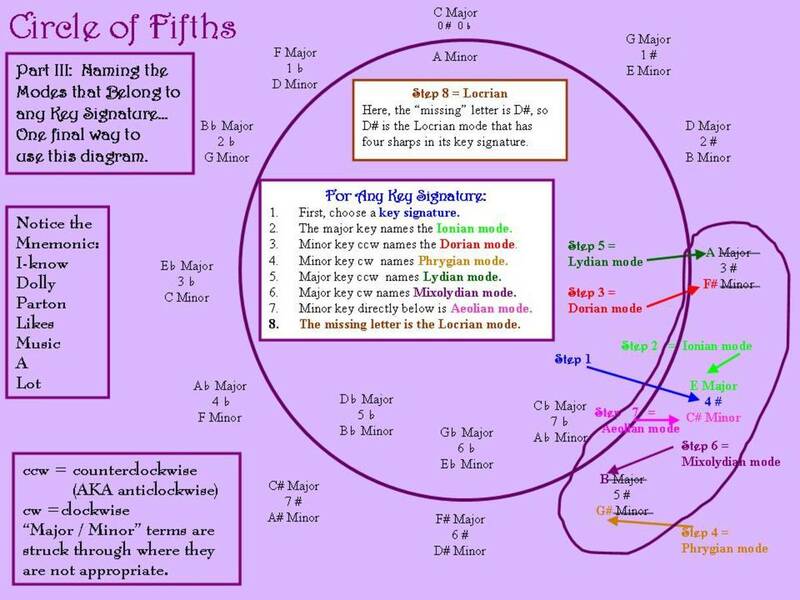 One additional, exciting way to use the Circle of Fifths is to locate the various modes that fit with any given key signature. The following chart shows how this is done. The chart makes reference to a mnemonic that I like to use for remembering the names and patterns of the various modes (explained in “Marvelous Musical Mnemonics”). The sentence “I-know Dolly Parton Likes Music A Lot” uses words with initial letters which correspond to the modes (in order) Ionian-Dorian-Phrygian-Lydian-Mixolydian-Aeolian-Locrian. In these additional uses of the Circle of Fifths (locating Primary and Secondary chords and identifying modes which belong with a specific key signature), the movement from one chord to the next in numerical order or from one mode to the next in mnemonic order creates a kind of star pattern, shown below; in itself, this pattern can serve as a visual mnemonic to help with organizing the clusters of chords or modes, so they can be remembered more easily. Thank you for reading and commenting, claudio. I do hope these charts can have some use for other musicians (and even non-musicians who enjoy organizing various systems of thought). In checking about the typo you mentioned, I believe the problem may actually lie in the way I explained what I mean by those directions. For each movement clockwise or counterclockwise on these charts, I am referring to movement or direction from the key signature, not from the previous key mentioned. And, importantly, the movement should take the closest route, because on a circle we can reach a given point from either direction - but one path will be shorter than the other, unless the two points are 180 degrees removed from one another. 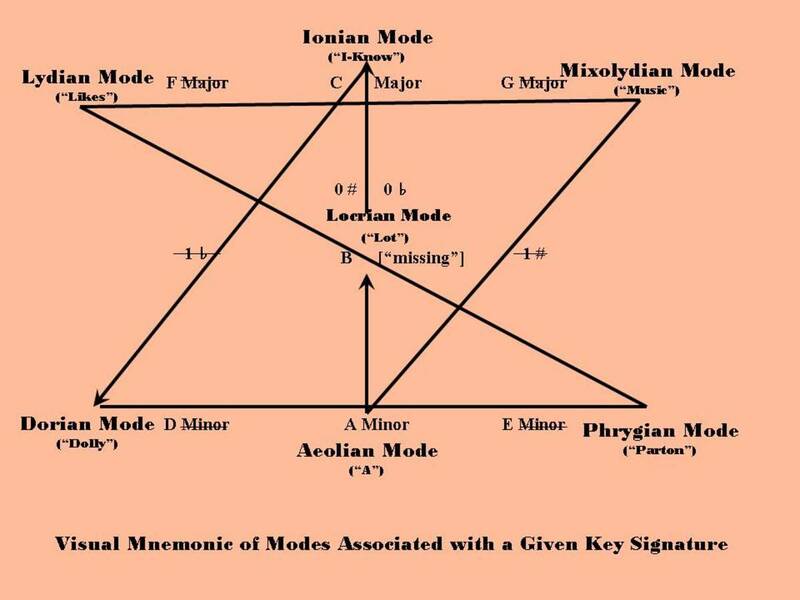 So, starting at 4# - Ionian mode of E major or Aeolian mode of C# minor - a counterclockwise move takes us to the Lydian mode of A and Dorian mode of F#; a clockwise move takes us to the Mixolydian mode of B and the Phrygian mode of G#. I appreciate your comment, because others may have the same understanding as you about the movement between the modes, and this gives me a chance to clarify the comments on the charts. Dear aficionada, thank you for these diagrams. They really help to understand all those relationships. I just want to point a small typo: in the Modes on the Circle of Fifths, Lydian is cw and Mixolydian is ccw. Thanks, chasmac! I really enjoyed that Hub, as I'm sure anyone who is interested in musical modes will be. I've been meaning to link to this hub for ages as it expands on my circle of 5ths hub very nicely. Finally done. Thanks for this detailed information, Danger Dave! I'll have to study it carefully to grasp even just a portion of it. I've really only in recent months begun investigating and trying to understand and organize information about scales from around the world, so I am thrilled to have these links. Apology: The links in my post just now were chopped by the comment software and incomplete. I split them by hand, so you'll have to join them by hand. --Danger Dave Z. There are several scales for Byzantine chant, all laid out nicely in two documents from the Antiochian Orthodox Archdiocese site (links below). The second mechanism you describe for augmented second in the lower tetrachord is what is done. Hungarian major does a lower tetrachord augmented second between tonic & raised second (Pocket Music Dictionary, Hal Leonard, 1993, p236). What you describe for the Niavent/Egyptian scale occurs in Hungarian minor (same source). This is the first I have heard of Niavent. Singing in these several oriental scales has been a great pleasure for me. The cantor who teaches me (a retired engineer from Lebanon, whose wife teaches Spanish) is an adult learner and does not attempt the microtonal notes in either the Arabic or a particular local Russian tradition, said in the Antiochian references to differ subtly. Differences in the Byzantine and Russian traditions also affect terminology: "tones"/"modes" are also numbered differently. I am not learning Arabic; I live too far from church for classes. I have sung a little of this music in Russian, but Atallah's parish sings mostly in English, with smatterings of Arabic and Greek (and Russian when I'm there). Thank you both, hotwebideas and dzethmayr, for reading and for your comments. I agree with the necessity of practicing scales and the importance of total comfort and familiarity with scales in all different keys and tonalities. There are so many scale types from around the world, it can make our heads spin! On your speculation about "jazz minor" or melodic minor descending as well as ascending, my bet is with you. I hear it often these days even though I don't listen to jazz much. I sing Byzantine chant, where several of the scales do the harmonic minor augmented second melodically, both directions. The aug second also appears in the lower tetrachord as well. 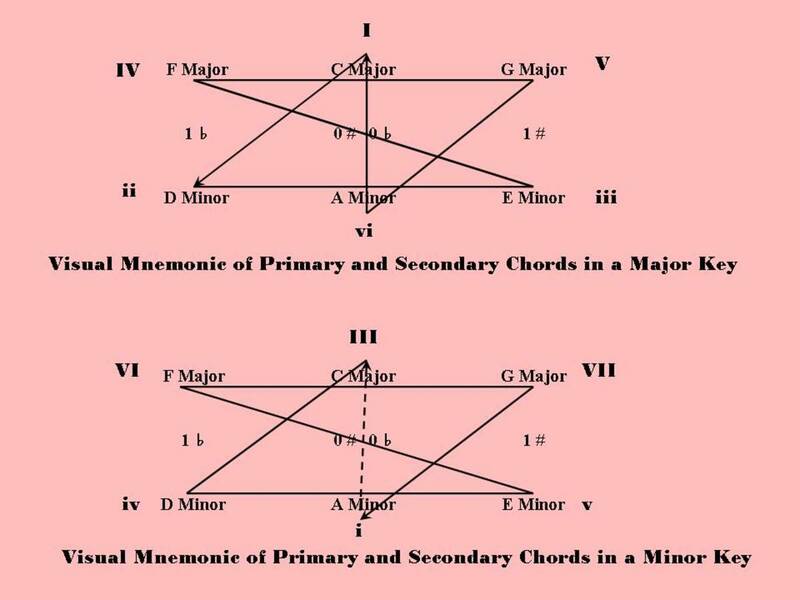 Current music in minor seems to use the melodic minor scale in both directions, probably because of the present thirst for major brightness in the dominant and subdominant chords even in minor tonality. As if whistling in the dark. I will have to bookmark this hub and use it as a bible for my jazz sax playing. I know you are a music teacher, as it says in your hubber profile, but I also teach piano and saxophone so we are both teachers. The circle of fifths is very important for improvising, especially when I solo. I believe however that the scales are everything. Knowing the scales inside and out for any key is what makes a good soloing musician and the circle of fifths is a good method to deviate from that, as you mentioned in the sharps and flats section of your hub. Thanks for this hub! I need to study your diagrams a little closer.